The Lichemaster has raised an army of undead. His opening move is to deploy Ranlac the Black and a phalanx of skeleton warriors to ambush a handful of prospectors working a nearby mine. This is the necromancer's first step towards seizing the Frugelhorn Valley and raising its slaughtered inhabitants as zombies. But what Kemler hasn't reckoned upon is that this isn't any mine. 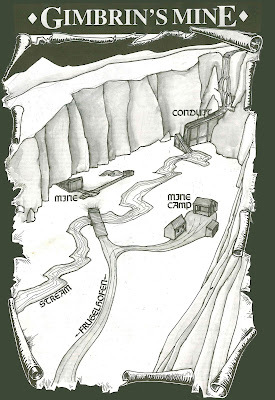 This is the mine of Gimbrin Finehelm and his warband of beautifully helmeted dwarves. In this first battle in the Terror of the Lichemaster scenario pack, Gimbrin Finehelm and his 5 followers face off against 21 skeletons. The dwarves are cornered in a steep ravine, and have limited options. It's the classic underdog scenario. They could try scattering in hopes that a couple dwarves can escape the cordon and warn the villagers at Frugelhofen. Or should they stick together and try to break out as a team? Or can they defeat the undead wholesale by exploiting defensible terrain? Or will they simply grit their teeth and sell their lives as dearly as possible? Terror of the Lichemaster doesn't give us very much information about the character of Gimbrin - just that he is an adventurer trying to resuscitate an old mine without much success. 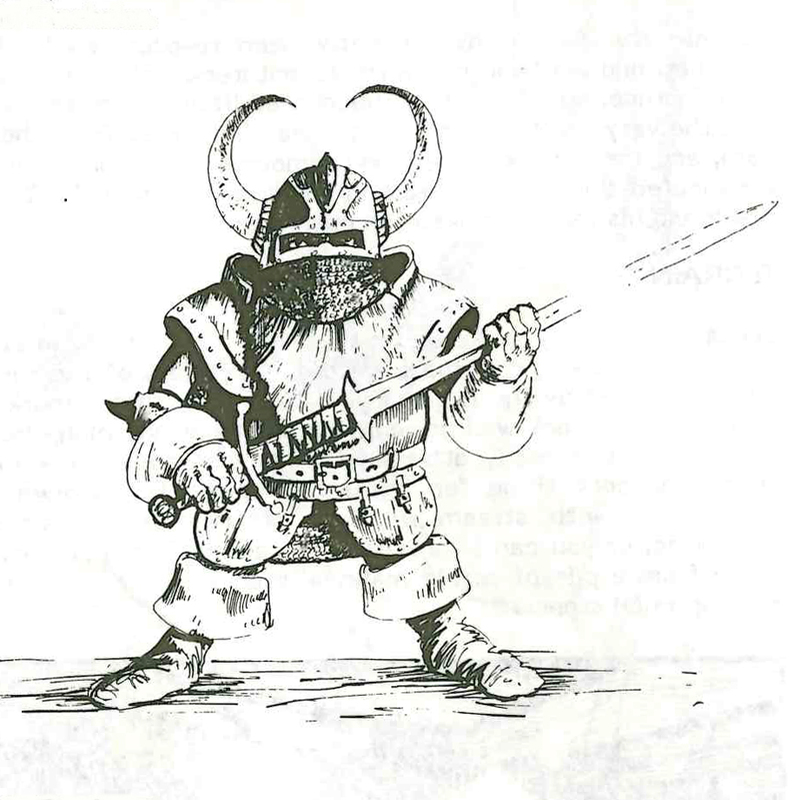 But he reappears in Return of the Lichemaster (1989), where we are told that he is a "thoughtful" and "powerful" leader", and "is thought handsome by Dwarven standards, having a beard of exceptional sleekness" (p. 83). 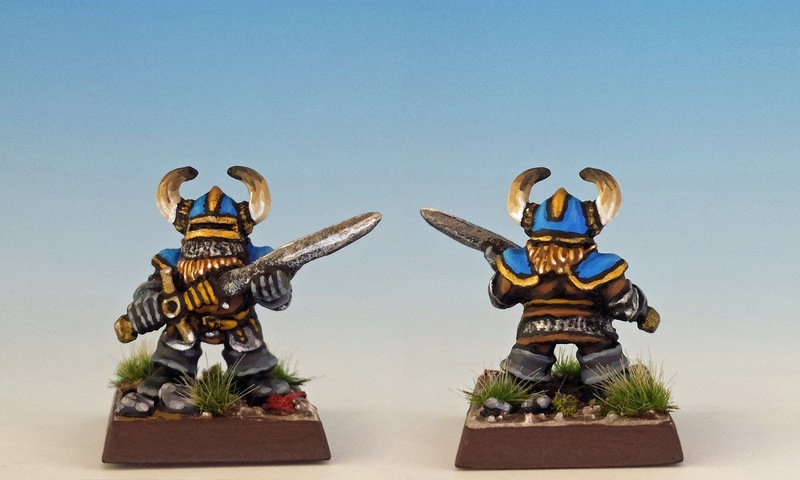 What I can tell you about Gimbrin is that he was the 2nd most expensive miniature I've ever bought. * It seems that he is the rarest of all the miniatures in this scenario pack, and never saw any release outside special mail orders during the 1980's. 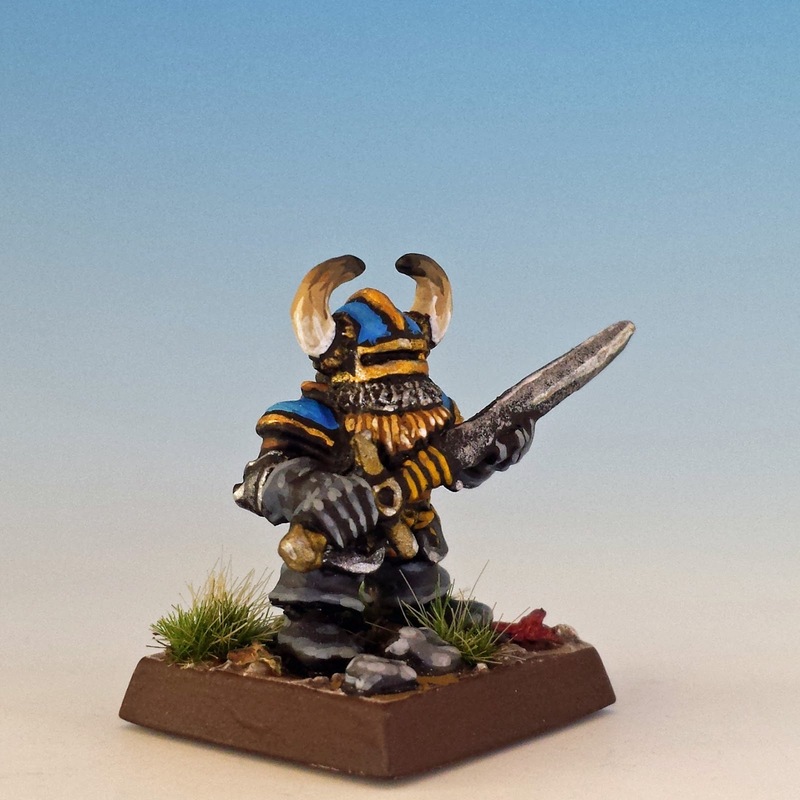 When he surfaced on eBay in late 2012, he represented the last Lichemaster miniature for my collection. And so I entered into one of those crippling bidding wars where, at the last second, you swoop in and bang a nauseating sum into eBay, assuring yourself that your stratospheric buffer is completely unnecessary. And then you wait the 2 or 3 remaining seconds of the auction to discover that some jackass has done exactly the same thing. When all is said and done, Gimbrin is a beautiful miniature. 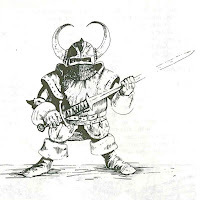 His helmet is unique in the Citadel range of dwarves, what with its long rectangular visor and the short aventail (the curtain of chainmail hanging from the helm). I really wanted Gimbrin to stand out in the crowd -- I hadn't paid all that money for a wall-flower! -- so I gave his armour a bright blue accent. And doesn't his beard look sleek? ** You also congratulate yourself for finding a phlegmatic girlfriend. 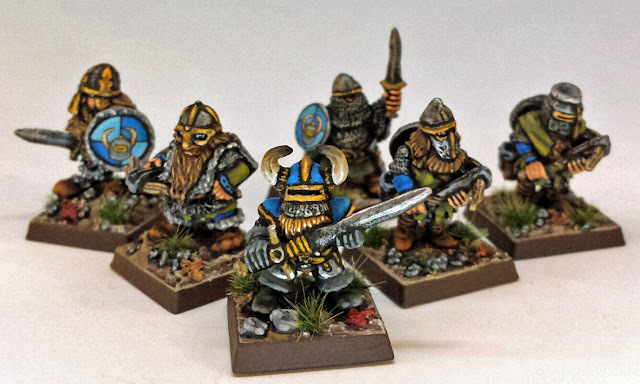 Awesome spirit of old miniatures! I'm in! Thank you, Phil. I loved your most recent battle report! I think anyone who is a collector of old lead has been there with regards to eBay. I wince at the time but when I paint them up and start playing with them it all feels worth it. Lovely work too BTW! That's quite true -- as long as these old pieces of lead get paint, love and use, almost any price tag is worth it. Ooh, very nice. The blue/gold/olive colours are really nice, and Gimbrin does indeed look excellent: distinct and dramatic. That was a scary read. I've never sold anything on eBay but there are a lot of ways to get screwed as a seller. Some as a buyer too, but you're still at an advantage. The only bad eBay experience I had actually cost me nothing, but left me pining for the cool figures I'd "won", but was unable to acquire due to a seller with a good reputation suddenly ghosting for presumably personal reasons. Yes, eBay can be scary. I've only sold one thing on eBay, and it did make me feel a little vulnerable. These days, I am backing away slowly from eBay. I still buy stuff, of course, but I've strong-armed myself into concentrating on what I have rather than buying cart-loads of new lead. Lovely painting but those horns on Gimbrin are amazing. Care to give a bit of a tutorial and colors on them? I'm glad you liked the horns! My technique is simply a matter of layering. It's fiddly and takes a while, but the basic idea is easy. STEP 1 - I paint the entire horn a base colour, like "Bone White" or sometimes something more yellow like a 50:50 mix of "Desert Sand" and "White". STEP 2 - Usually, I then use 2 or three layers of darker shade toward the base. So I start with a mix of - say - 4 parts "Bone White" to 1 part "Khaki" and apply one layer. And then closer to the base, I set down a layer of 1:1 Bone White and Khaki. The most important thing is that the borders between these layers isn't a straight line " -------- ". Instead, it has needle-like jags, like a heart-monitor. STEP 3 - If you want to make the horns black tipped (like some steer horns) you follow this same technique from the middle of the horn up to the tip. The tip should be pure black, and then a layers of 1:1 pure black and "Charred Brown" and then mixtures of "Charred Brown" and "Khaki" until you are once again blending the base colour of "Bone White" with "Khaki". Again use needle-like jags for the borders. Looking a Gimbrin, his horns were so small that I didn't do this whole shebang. I skipped step 2 and mainly concentrated on blackening the horns. Damn fine work again brother! Really nice. I've enjoyed catching up with the blog and reading about the Lichemaster scenario. I think we've all had those auctions that we've "regretted" winning. At least you got something that is actually rare. Looking forward to the next installment. Glad to have you back, Sean! You are getting all the jewels of the crown for this project, and they all look sweet. Nice job! And soon it will be Mikael Jacsen's turn in the light! So, so very great! Beautiful work on Gimbrin and his buddies. Love it, love it, love it! More, More, More! Oh, you will be getting more! These figures all look so goooooddd oh Goddd! I feel dirty, satisfied and improved. Tissue please. If u need an opponent I know a guy. He drinks too much, but always brings booze.